Chess players chosen for Gert Sibande Trials. On Thursday, 3 May, chess players from Mkhondo participated in the municipal chess trials to hopefully advance to the circuit trials, which will take place on Saturday, 19 May. The players competed in separate girls and boys sections for U/13’s, U/15’s and U/18’s. Boys U/13: 1) Siboniso Mkhonza, 2) Mthobisi Vilakazi, 3) Ndumiso Manana, 4) Makabongwe Vilakazi, 5) Andile Manana, 6) Lindokuhle Zulu and 7) Spesihle Dhlamini. Girls U/13: 1) Phumlile Nkosi, 2) Hlobisile Khanyile, 3) Nombuso Tshabalala and 4) Sibusile Mbatha. All U/13 players came from Ndawonye Primary School. Boys U/15: 1) Hanno Viviers – HPR, 2) Sisanda Khumalo – NSS, 3) Amaan Mahomed – HPR, 4) Carwyn Venter – HPR, 5) Rishay Singh – HPR, 6) Bonginkosi Silinda – NSS and 7) Siyabonga Khanyile – NSS. Girls U/15: 1) Zama Dlamini – NSS, 2) Nonkuleleko Nkosi – NSS and 3) Luyanda Ngwenya – NSS. Boys U/18: 1) Phila Mabaso – NSS, 2) Joshua Carr – HPR, 3) Nkosiyasi Mndebele – NSS, 4) Mndeni Nene – NSS, 5) Siyabonga Kubheka – NSS, 6) Sbongakonke Lukhele – NSS and 7) Mathew Lewis – HPR. This is the second year in a row that Phila has won this section and we hope to see him continue playing high quality chess for Mkhondo. Girls U/18: 1) Elizabeth Carr – HPR, 2) Lené Viviers – HPR, 3) Sagarika Dash – HPR, 4) Nomcebo Shongwe – NSS, 5) Ayanda Vilakazi – NSS, 6) Vuyisile Sengwayo – NSS and 7) Zuzile Thela – NSS. 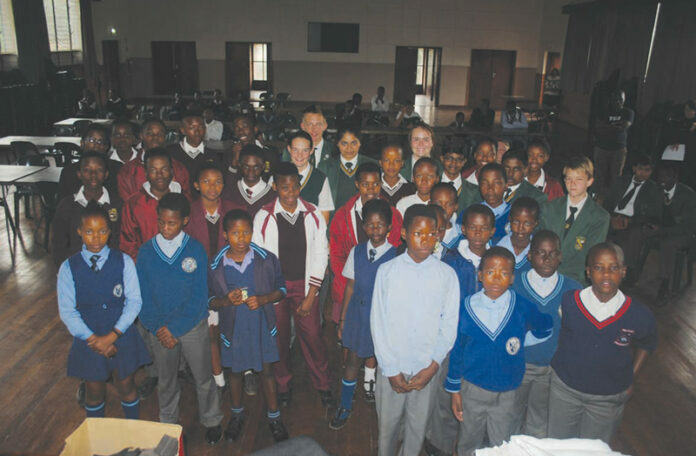 The following codes were used to indicate the schools from which the children are from: HPR for Piet Retief High School and NSS for Ndlela Secondary School. Nthando Kunene, a Rising Star!